DVD Synopsis: Welcome to Britannia Hospital, an esteemed English institution marking its gala anniversary with a visit by the Queen Mother herself. 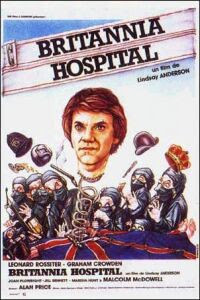 But when investigative reporter Mick Travis (Malcolm McDowell) arrives to cover the celebration, he finds the hospital under siege by striking workers, ruthless unions, violent demonstrators, racist aristocrats, an African cannibal dictator and sinister human experiments financed by the Japanese. Can Mick survive one very strange day in these unhealthy halls or is the entire British Empire in critical condition? Britannia Hospital is a biting satire of, well…a lot of things, really. In fact, by the time the film is over, nobody, regardless of class or occupation, has escaped unscathed. There are some funny scenes (the royal representatives advising the hospital staff how to address “HRM” during her visit to the hospital is priceless), one or two that are difficult to watch (like the experimental “operation” that turns surprisingly gory), and a wrap-up to the entire story, delivered by the film’s mad scientist, Professor Miller (Graham Crowden), which leaves you with plenty to think about. By taking aim at so many segments of society, from union leaders to the upper-class to the overly-invasive press, I’m guessing Britannia Hospital pissed a lot of people off.